Out in space, a strange meteor approaches the Earth. It turns out to be a space ship piloted by Skul and Bean, two of Queen Maligna’s children. Maligna has finally decided to take the planet Krang promised her: Earth! Skul and Bean report telepathically to their Queen. Apparently, the destruction of Earth’s ozone layer by man has made the planet a perfect place for her children (oh gimme a break). Skul and Bean then proceed to swoop down toward the surface of the Earth in search of an Earthling willing to aid them in their conquest. Meanwhile, in the Gulf of Mexico, the Turtles, April and Man Ray are all riding humpback whales to the mouth of the Mississippi River. April is enjoying the ride, though she can’t help but dwell on the “N” logo she saw at the Deepdump site, as she swears she’d seen it before. The group decides to take a rest at a derelict freight ship that had once been the source of a great oil spill (grrr). Their horsing around is cut short by the arrival of numerous fishing boats out to catch shrimp. April worries that the shrimp nets might catch other local critters, like sea turtles (oh no!). Man Ray soothes her fears by explaining the mechanics of a T.E.D., or “turtle extracting device”, which is installed in all shrimp nets and prevents them from catching anything other than shrimp (very educational). He then describes the history of the Kemp’s Ridley sea turtle and why it’s nearly extinct (woefully educational). April asks if Man Ray can take her for a closer look at the shrimp nets and he agrees. The Turtles, on the other hand, decide to respond to the psychic calls they’d been getting from Splinter through group mediation. Underwater, Man Ray and April notice one of the fishing boats has not installed any T.E.D. devices, which is apparently illegal. Outraged, Man Ray attacks the boat, headed by the patch-eyed, peg-legged Captain Mossback. Mossback and his men capture Man Ray in a fishing net and club him into unconsciousness. Back at the derelict oil freighter, the Turtles succeed in reaching Splinter, who is joyous to hear from them after so long. Their communication is interrupted when an exhausted April arrives, relaying Man Ray’s plight. Leo gets an idea and the Turtles prepare to retaliate. Later that night, Captain Mossback pulls in his shrimp haul, only to find the net filled with litter (groan). 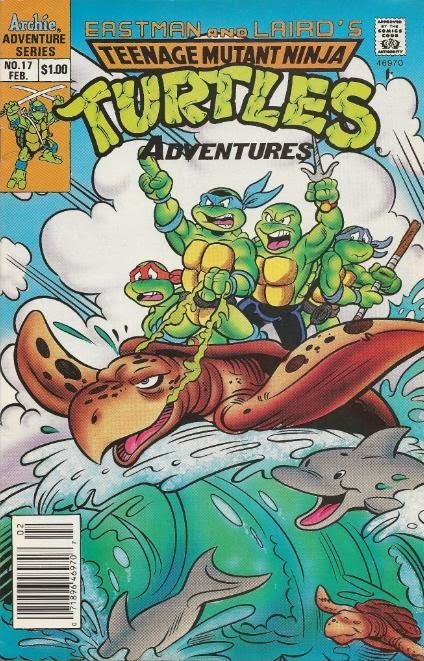 Arriving on the back of a giant sea turtle, the TMNT claim to be the Elder Gods of the Seven Seas, infuriated at Captain Mossback for all the sea turtles he’d killed. Most of Mossback’s crew flee the ship in terror, though Mossback isn’t as spooked. Manning his harpoon gun (shrimp boats have harpoon guns? ), he chases the Turtles off. The Turtles swim over to a deserted shrimp boat and take control, returning to Mossback’s ship for a final assault. As the TMNT deal with Mossback and the remnants of his crew, April frees Man Ray. Enraged, Man Ray attacks Mossback, who stumbles over the side of the boat in fear. Mossback reveals that he can’t swim, but is ironically saved by the giant sea turtle. Back in New York City, Kid Terra returns to Null’s skyscraper to explain his failure at the Deepdump site. Null is unconcerned and instead introduces Kid to his newest associates: Skul and Bean. 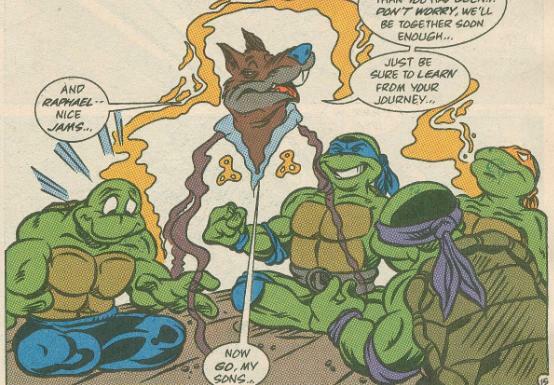 *This story is continued from TMNT Adventures #16. This story continues in TMNT Adventures #18. *Cap'n Mossback will return in Mighty Mutanimals #8. *The Turtles will use their psychic connection to Splinter again in TMNT Adventures Special #1, in the story "The Last Sea Serpent". 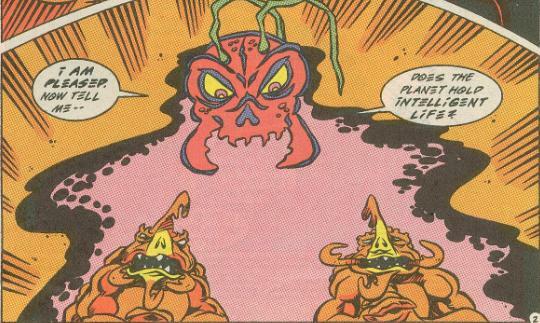 *Queen Maligna was promised Earth by Krang in TMNT Adventures #12. *Queen Maligna and her children were last seen in TMNT Adventures #13. *This issue was published in the UK by Fleetway in TMHT Adventures #28. I think I’m gonna be sick. Every issue of this arc has gotten progressively more preachy, with this issue culminating in a massive finger-wagging session directed at polluting, industrialization, deforestation, wildlife endangerment, ozone depletion and…God, just about everything else. We even get saddled with two pages of exposition from Man Ray as he describes the dynamics of a T.E.D. and the history of endangered sea turtles. Trying to deliver a message through a comic is fine, but when you get to the point where you’re treating your audience like they’re idiots and beating them over the head with your agenda…guess what: you're doing it wrong. As a one-shot villain, Captain Mossback is…decidedly lame. 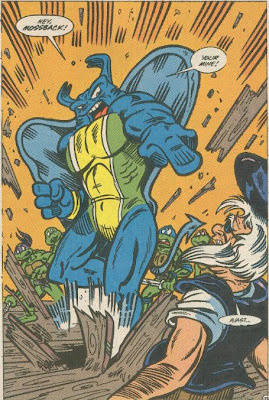 He’s basically a Captain Ahab/generic pirate amalgamation that seems completely ridiculous even within the outrageous world of the TMNT. Still, I suppose I prefer him over the generic South American guerillas and henchmen we’d been getting in the previous issues. The only real item of consequence in this issue is the escalation of the Null subplot and the reintroduction of Queen Maligna and her children. This will spearhead the next major story arc that really kicks off next issue, when the Turtles return to Manhattan. While I pretty much loathed the South American tour arc of the series, it served an important purpose to the ongoing story of TMNT Adventures, introducing characters that would go on to form the Mighty Mutanimals and giving us lots of background on Null, who’ll prove to be a pretty cool villain. While the plot threads introduced in this arc were quite important, the execution was just abysmal. These four issues are truly a chore to read, lacking pretty much any semblance of entertainment value and treat the audience like they’re idiots (newsflash: contrary to popular belief, kids are not stupid and can actually pick up on messages if you deliver them subtly!). Just be glad it’s over. Hi, i am curious, did you also read these comments when you were a kid like I did? I am 27 now, and when I was 10 I really enjoyed this episode also. I enjoy your reviews but your cynicism seems so...grown up.